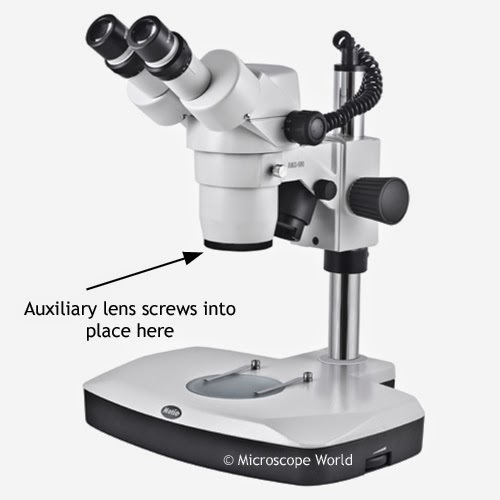 Microscope World Blog: Why Use a Stereo Microscope Auxiliary Lens? A stereo microscope auxiliary lens screws onto the base of the body of the stereo microscope. Stereo Microscope showing where Auxiliary Lens attaches. There are several reasons why you might want to use a stereo microscope auxiliary lens. Sometimes using an auxiliary lens is the best way to increase or decrease magnification, especially if you are using a microscope camera. Microscope magnification can be changed by using different eyepieces such as 5x or 15x eyepieces. However, if you have a camera mounted on the trinocular port of your microscope, changing the eyepieces will not change the magnification that the camera sees. Adding an auxiliary lens will change the magnification you see both in the eyepieces as well as through the camera. 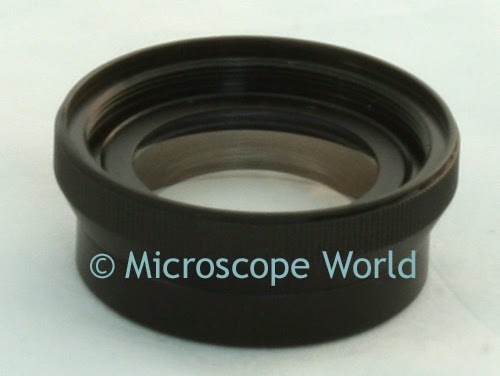 Stereo microscope auxiliary lenses are also used to change the working distance of the stereo microscope. Working distance is the amount of required distance between the top of your object and the bottom of the microscope lens in order for the sample to be in focus. Increased working distance is often desired when soldering, assembling printed circuit boards, or performing dental lab work.